⚽ Gang Chen opens with a general introduction to field of thermoelectrics. 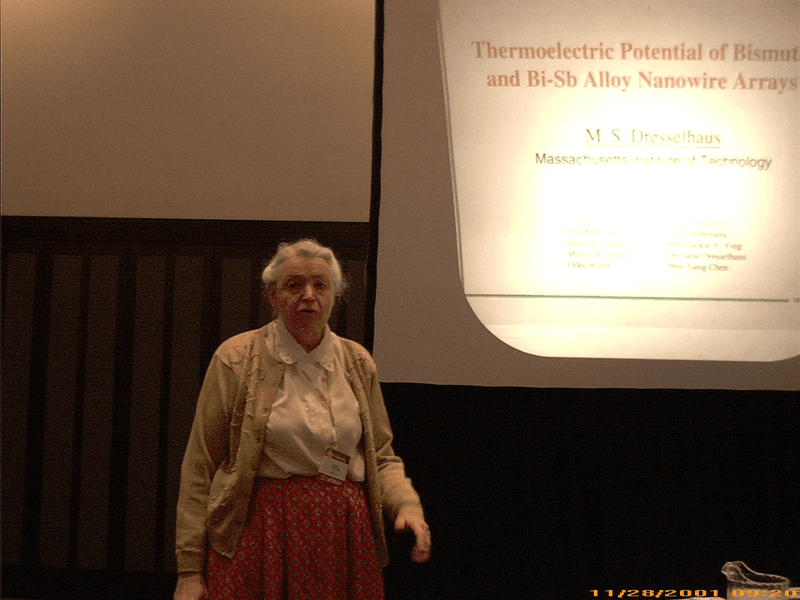 Welcome to the session on thermoelectrics. 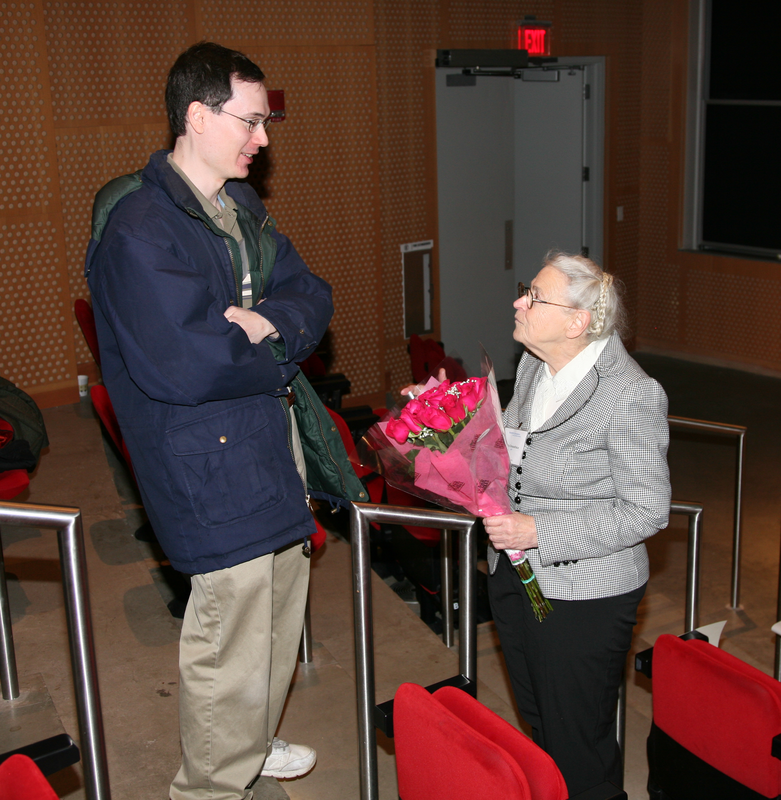 Yesterday, many of you were at MIT and, there, we highlighted Millie's contributions in the thermoelectrics area. Today, we'll focus more on the current exciting research going on in the field, and then we'll have a panel discussion. I just want to remind people that this session is being recorded, so if you have questions, please go to the microphone to ask them. Since not everybody here is familiar with thermoelectrics, I will open this session with a short introduction to the field. Thermoelectrics is the science of converting temperature differences into electric current. 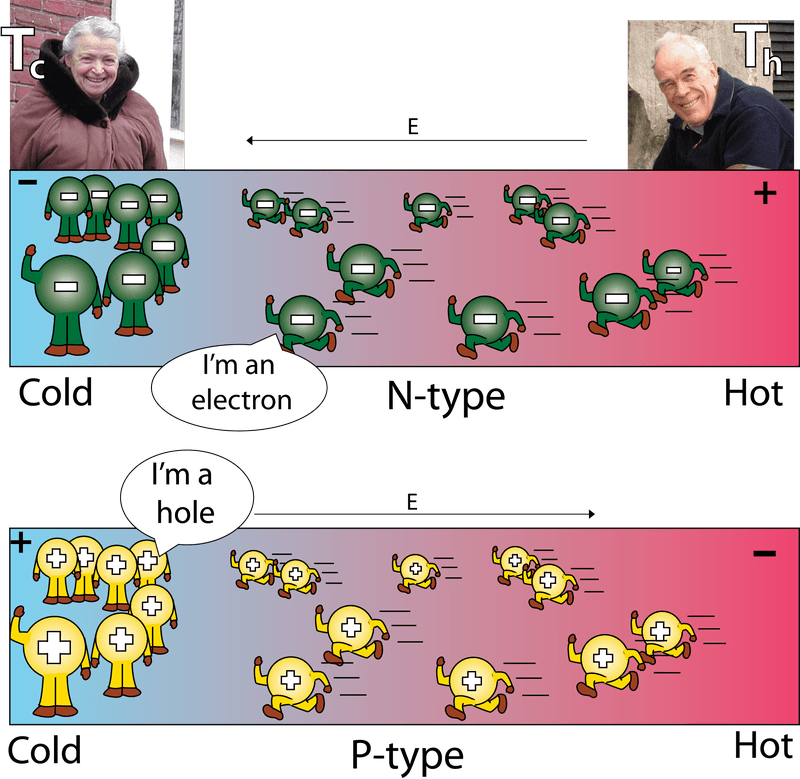 If you think of what that means on a subatomic level, thermoelectrics really uses the electrons to do the work. Imagine we have one side of a material that's hot, while the other side is cold. We know that diffusion will happen. And if you have electrons and holes in semiconductors, they will diffuse from the hot to the cold side, which generates the buildup of charge, which then generates voltage — and that's known as the Seebeck effect (see image to the left). Now, the key for thermoelectrics, in terms of efficiency, is engineering the material you are using so that it has a good ‘figure of merit’, also known as ‘ZT’. The figure of merit depends on electrical conductivity (σ), the Seebeck coefficient (S), and thermal conductivity (k). The Seebeck coefficient is how much voltage you generate per-degree temperature difference — and if you use a thermocouple, that is what it measures. Looking at the equation for the figure of merit, you’ll notice that thermal conductivity is on the denominator — in other words, it inversely affects the figure of merit. Think about it like this: when one side is hot, the other side is cold. We do not want the heat to leak, via heat conduction, from the hot to the cold side. So you can say, of course, that a heat engine is limited by Carnot and, if you get to a figure of merit = 2 and/to 4-ish, you can be very competitive against some of the established heat and conversion hydroelectrical energy conversion technology. Thermoelectrics can also do cooling. If you pass current, it carries heat from the cold to the hot side. So this field is really about three things. First, it’s about the discovery and improvement of thermoelectric materials — both the development of new materials and the improvement of current ones. It’s also about understanding the transport, because it involves the electron and phonon transport. Finally, it’s about thinking up devices and applications which might have industrial impact. I already mentioned that ZT is a contrarian property. The problem is that electrons determine the electrical conductivity and the Seebeck coefficient. They also contribute to electronic thermal conductivity. On the other side, you have a lattice vibration that carries heat. So the thermal conductivity by lattice is a complete parasitic. If you look at the electrical conductivity and thermal conductivity by electrons, it generally is limited by the Wiedemann-Franz law. Of course, there are some new developments in the field, which means that even this law could potentially be broken in nanostructures. The dilemma is that we have to engineer and optimize these properties simultaneously. To do that, we must think of the electrical and thermal conductivity together. This is absolutely vital when creating a new material, because when you tune one property, you may lose the other. So first, you have to tune the carrier concentration to an optimal. Metal has lots of electrical carriers and a high electric conductivity, but its Seebeck is very low. An insulator has a high Seebeck coefficient but a very low electrical conductivity. The optimal is typically in heavily doped semiconductors or semi-metals. Ideally, for lattice vibration we want something like a glass, for example, which is not a good heat conductor. So it’s an ideal substance for phonons. For electrons, on the other hand, you want a crystalline material (which has a high mobility). All this may seem simple in isolation, but remember: with thermoelectrics, you want both of these things to happen in the same material! So you need to create a material that has a lattice vibration similar to glass, for the phonons, but which is also crystalline and has a high mobility, for the electrons. 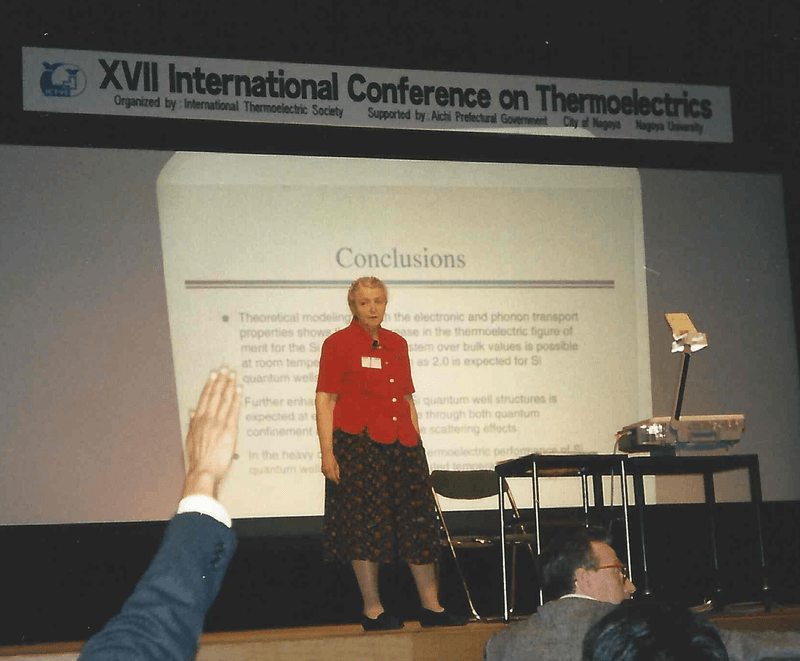 Millie presents a talk at the International Conference on Thermoelectrics, 1998. This was summarized by Glenn Slack. If you look more at the fundamental level and if we take a look at the Seebeck coefficient, it's basically the average energy of electrons relative to the Fermi level. And that's the thermal energy carried by electrons. At the same time, we have to look harder at the electric conductivity because we want the S²σ to be high. The electric conductivity, of course, is related to mobility, relaxation time, the scattering, and a density of states. Basically, we want a high density of states in this area, especially when you've got a high Seebeck coefficient. Nature does not give us lots of materials with high density of states. Instead, nature tends to give us materials without much tunability. So, where nature falls short, we must pick up the slack! Millie had this idea that, by using quantum effects (quantum wells, quantum wires), you can create spikes in the density of states. This is basic quantum physics, so you do not need to know a lot of quantum physics to be able to understand this. 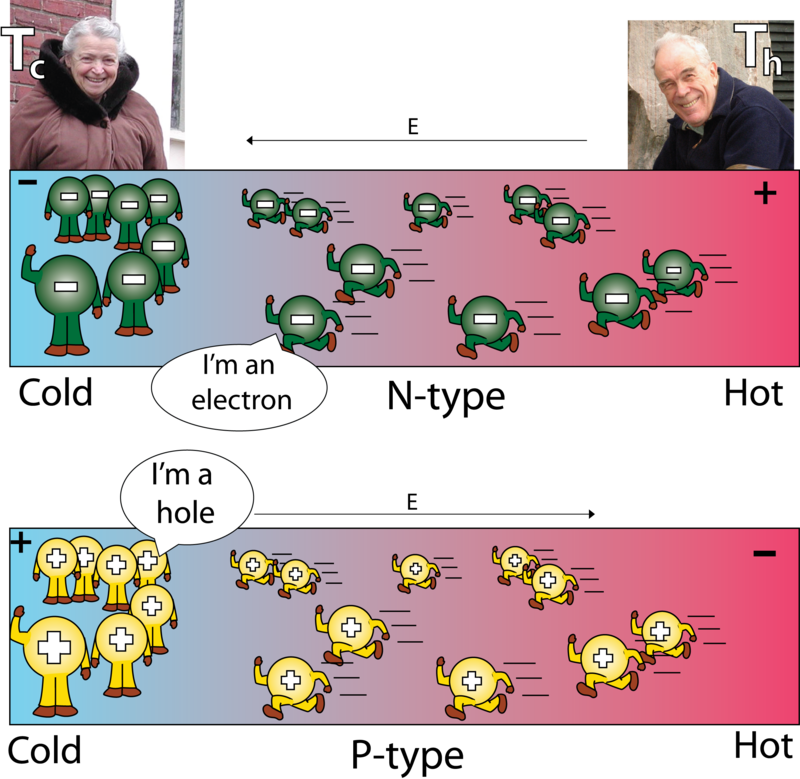 However, people hadn’t realized that they could apply this basic quantum physics to thermoelectrics. Millie had the insight to say, “Look at quantum mechanics. There’s potential, here. 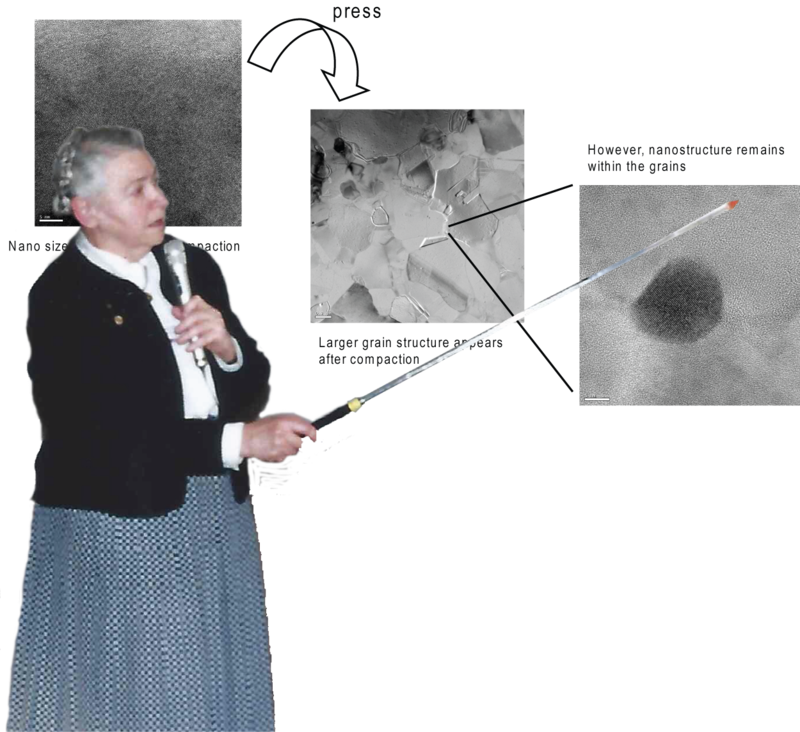 It’s a good direction to explore.” And, in addition, she also knew that, by using nano, the interface can both scatter photons and lower thermal conductivity. 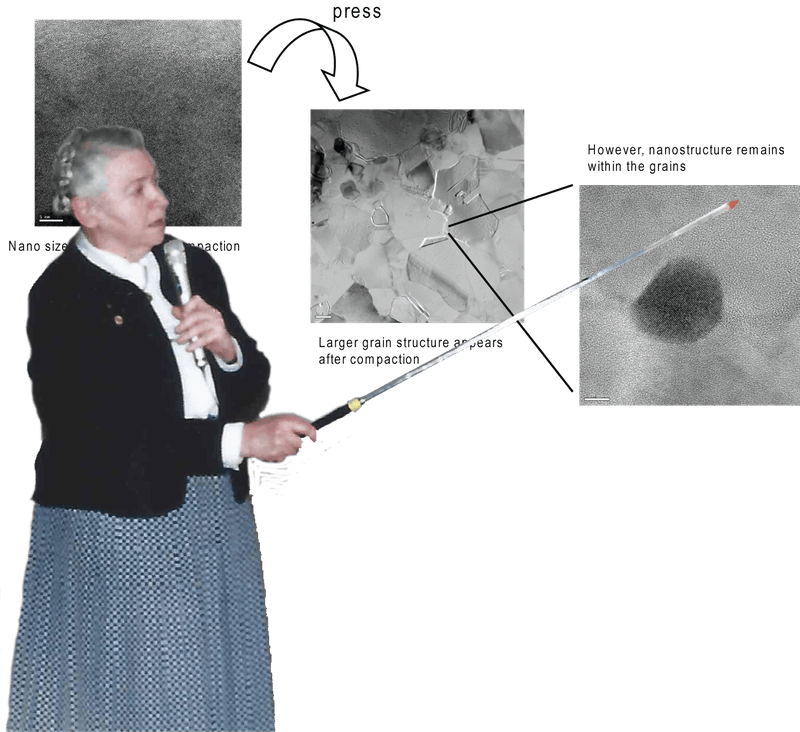 Millie’s ideas have really spurred the development of thermoelectrics over the last 20 years. Materials development has made leaps and bounds. Across the world, people have taken Millie’s ideas as a spark of pure inspiration and have continued to build on those ideas and then continue onwards in different directions. 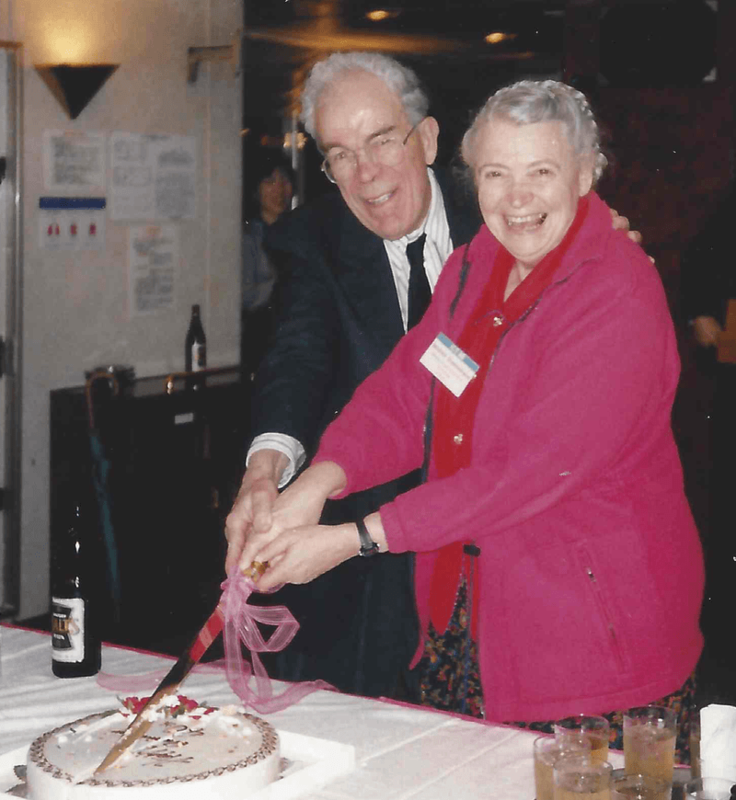 Like a tree in the ground, the Hicks and Dresselhaus paper of 1993 was the seed that allowed the field to sprout and flourish. We still have to provide it with the water and sunlight of new ideas, but the branches can grow in many different directions, all given life by that initial inspiration. 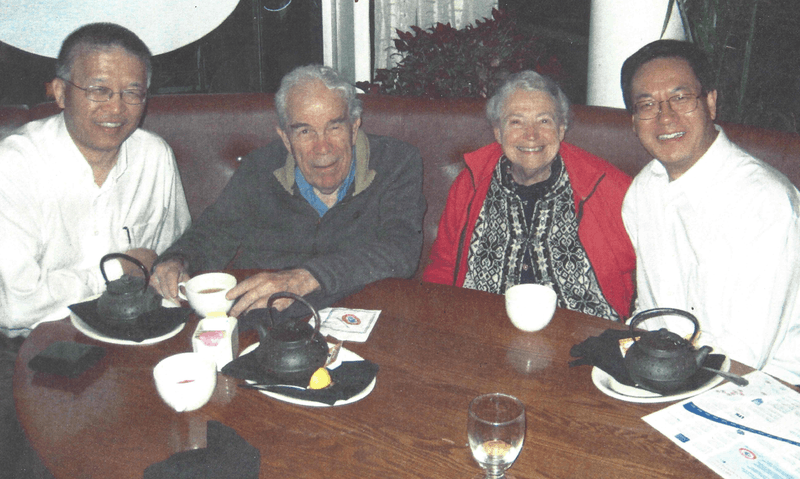 Millie gives a thermoelectrics lecture in 2001 on the work she and Gang Chen have been doing. Since 1993, the field has made a lot of progress in reported peak thermoelectrics (ZT). However, as with any scientific field, the most exciting part is not the discoveries that have already been made — it’s discovering those that are yet to come. As we continue this session and learn about the progress that has been made, today, I encourage all of you to hear it and allow yourselves to be inspired, so you can create the research of tomorrow. Today, we have a great panel that will talk about many different aspects of thermoelectrics — fundamental science, materials, and the industrial applications.